ANN ARBOR, MIFirst, there was the creation of numerical control (NC) in 1948. Then there was computer numerical control (CNC). Now, the next industrial revolution is here, with OpenCNC® on Microsoft® Windows NT® from Manufacturing Data Systems, Inc. (MDSI). Visitors to Booth D1-3045, Factory Automation Pavilion, IMTS 98, will see the future of CNC control technology, and the message is simple: The control is software. You don't need any proprietary hardware to do it. You can retrofit a machine tool yourself. You can run a software CNC control on Windows NT and integrate it with your Manufacturing Execution Systems (MES) and Enterprise Resource Planning (ERP) applications. MDSI has proven it all by running OpenCNC on production machine tools at a variety of customer sites since 1993. With the introduction this summer of the Windows NT version of OpenCNC and the OpenCNC Application Programming Interface (API)-two more revolutionary ideas in the CNC world-MDSI continues its history-making path. "Our customers have now logged over a half-million hours of production time with OpenCNC on their machine tools," says Lawrence Schultz, president, MDSI. "One customer has improved its return on net manufacturing assets to over 60% since standardizing on OpenCNC-over twice the industry average." 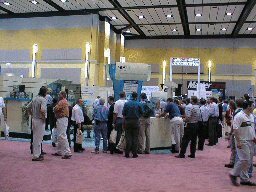 At IMTS 98 in Chicago, Sept. 916,1998, in Booth D13045, MDSI will demonstrate the power of a software CNC control. Through a multimedia presentation and demos running on a variety of computer types, visitors will discover how OpenCNC integrates the shop floor and makes the CNC machine tool an online peripheral device on the enterprise computer network. Third-party MES applications will be integrated with OpenCNC to show the power of OpenCNC's realtime data collection and open API. A video kiosk will show visitors the many applications and machine types MDSI customers are currently running with OpenCNC. 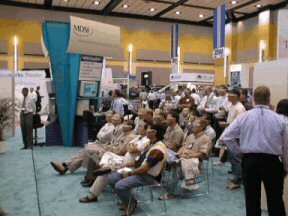 Also at IMTS, MDSI will mark the evolution of CNC technologyfrom NC to CNC to software CNC-by paying tribute to the man whose groundbreaking work set the stage fifty years ago. The company is honoring John Parsons, who pioneered NC in 1948. A special invitation-only reception will be held on Thursday, Sept. 10, from 710 at Spiaggia's on N. Michigan Avenue in Chicago. Co-sponsored by EDS and Microsoft, the event will include presentations from business and technology leaders in manufacturing, as well as Mr. Parsons. OpenCNC is the only production-proven, unbundled software-based CNC machine tool control on the market. Unlike traditional CNC controls, OpenCNC uses no proprietary hardware or motion control cards. The entire control is delivered on a disk. Because it's unbundled software that runs on off-the-shelf PCs, manufacturers are not locked into proprietary arrangements for hardware, control repair, or control upgrades. OpenCNC is a registered trademark of Manufacturing Data Systems, Inc. MDSI and the MDSI logo are trademarks of Manufacturing Data Systems, Inc. Microsoft, Windows, and Windows NT are either registered trademarks or trademarks of Microsoft Corporation in the U.S. and/or other countries. All other brand or product names are trademarks or registered trademarks of their respective owners.